MainStage and Logic now work as one integrated production and live performance duo. If you know Logic Pro X then you understand the power of MainStage 3’s Smart Controls. If you create MainStage patches then you get the deep new features introduced in Logic Pro X. They work together, share the same content and deliver a powerful solution for performers of all kinds of music. 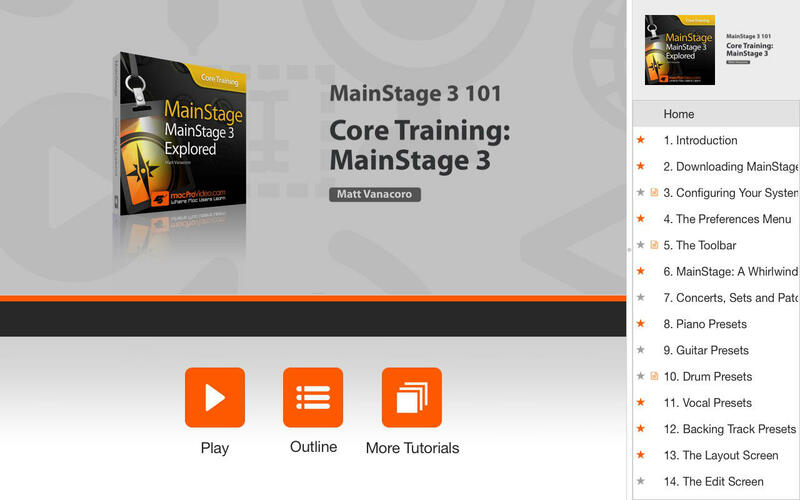 This course is designed by Matt Vanacoro – in consultation with Apple – to get you up and running with MainStage fast! You learn about every aspect of MainStage, from its newly designed GUI to its powerful live performance music tools! See how to set it up and configure your system and preferences. Then hold on tight as Matt gives you the whirlwind MainStage 3 tour. From there you’re into a section that demystifies and explains Concerts, Sets and Patches. Next, you learn all about the Layout, Edit and Performance screens. Matt then shows you how to customize MainStage to build your own custom sound banks. He explains multi-keyboard setups with their assignments and mappings. He then dives deep into MIDI and audio setups where you learn how to use the Playback plugin and the cool new MIDI FX.